There is an article in this morning's Bellingham Herald about a stomach-bug that's making the rounds (with a little help from its friends, human beings) in Whatcom County - a kind of "Christmas Crud" which causes the usual round of nasty gastric symptoms. It appears to be more annoying than lethal, although dehydration is a concern with the very young and the elderly. Nevertheless, no one likes having the Christmas Crud, so read on if you wish to avoid it. 1.) Wash your hands before eating, before preparing and serving food, and after using the bathroom. Wash them with hot water and soap, each and every time you do any of the above. One would think that it shouldn't be necessary to point this out to adults, that this is basic, civilized behavior. However, having done informal surveys of how many men use public bathrooms and exit without washing their hands, it is clear to me, according to the law of averages, that vast hordes of men simply do not wash their hands after going to the bathroom. See the footnote* below for a horror story about that. 2.) Also make sure that your kids wash their hands before eating, before preparing and serving food, and after using the bathroom. They should wash them with hot water and soap, each and every time they do any of the above. 3.) Invest in some tongs for transferring finger food from platters to plates. And keep the rugrats from having an impromptu party with the Christmas victuals. Chances are that Junior's hands have been dabbling in various filth and corruption, quite possibly including down his diaper. 4.) Practice food-safety when preparing or working with food, especially where perishables and meat are concerned. 5.) Think of it this way. It's rude and antisocial to give your germs to innocent bystanders when this can easily be avoided. *Now, for the horror story. Several years ago I was ringing the bell for the Salvation Army outside a local grocery store. After my lunch break, one day, I was in the public restroom adjusting my Christmas-red scarf in the mirror. Someone was in the stall behind me doing their business, and as I was about to go back to work, an elderly gent flushed and exited the stall and then the bathroom, without going near the sink. As I went back to work, I spied the same old gent, picking through the cheese samples at the deli counter. That's just nasty. Wash your hands, folks. If you end up driving the porcelain bus between now and New Years, don't say you weren't warned. 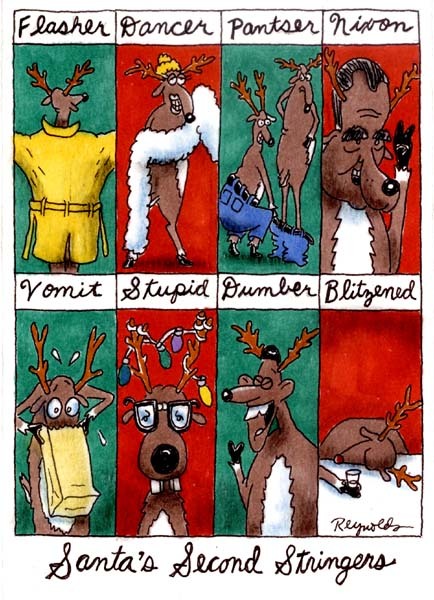 Can you guess which of Santa's "backup" reindeer, below, never washes his hooves before Christmas snacks?